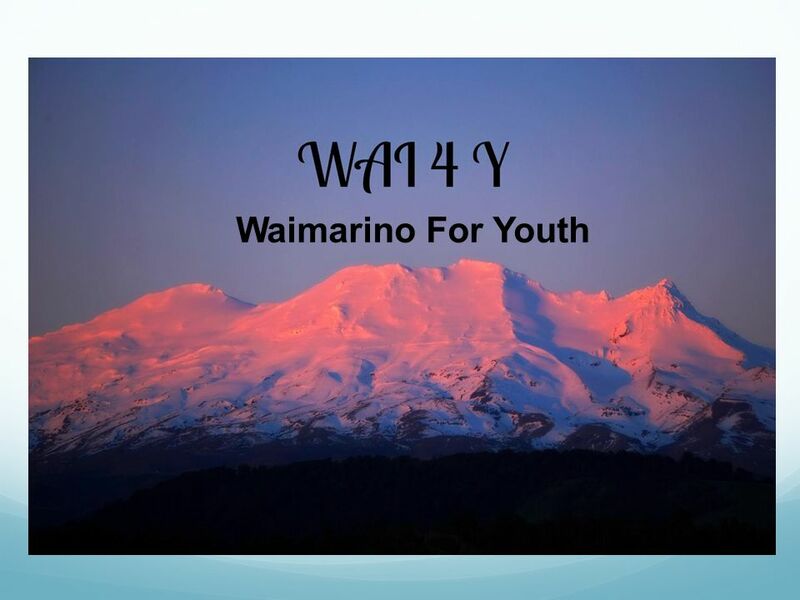 Waimarino For Youth. What Is Wai 4 Y and Who Are We? What? Wai 4 Y is a youth needs research project run by youth for youth. The Wai 4 Y project has three. 2 What Is Wai 4 Y and Who Are We? What? Wai 4 Y is a youth needs research project run by youth for youth. 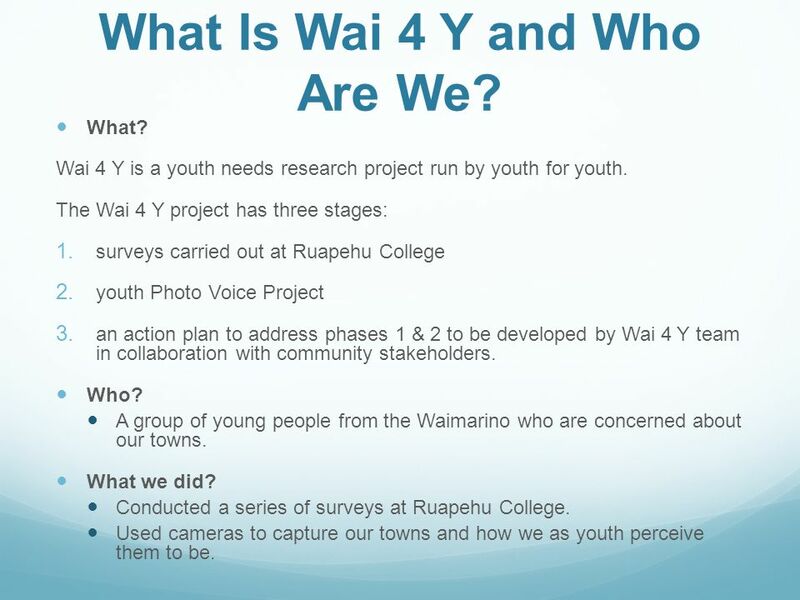 The Wai 4 Y project has three stages: 1. surveys carried out at Ruapehu College 2. youth Photo Voice Project 3. an action plan to address phases 1 & 2 to be developed by Wai 4 Y team in collaboration with community stakeholders. Who? A group of young people from the Waimarino who are concerned about our towns. What we did? 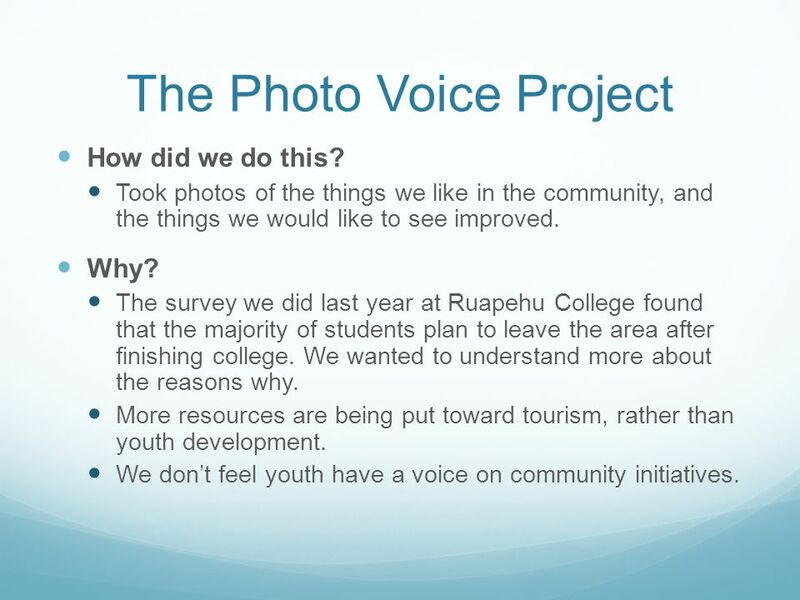 Conducted a series of surveys at Ruapehu College. Used cameras to capture our towns and how we as youth perceive them to be. 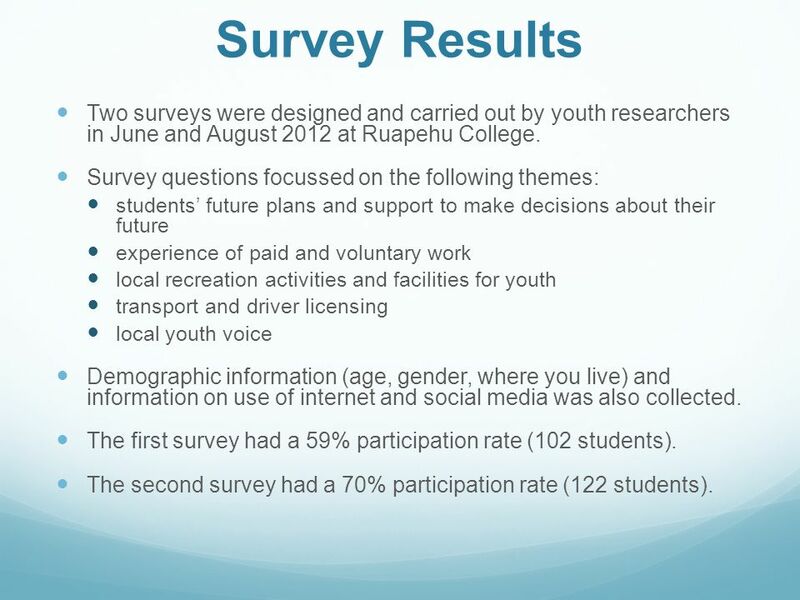 3 Survey Results Two surveys were designed and carried out by youth researchers in June and August 2012 at Ruapehu College. Survey questions focussed on the following themes: students’ future plans and support to make decisions about their future experience of paid and voluntary work local recreation activities and facilities for youth transport and driver licensing local youth voice Demographic information (age, gender, where you live) and information on use of internet and social media was also collected. The first survey had a 59% participation rate (102 students). The second survey had a 70% participation rate (122 students). 4 Future Plans Majority of students (52.9%) intend to move away from the district when they leave school while over a third are still undecided as to their future plans. Main reasons for leaving are to study (36%), and for work (28%). 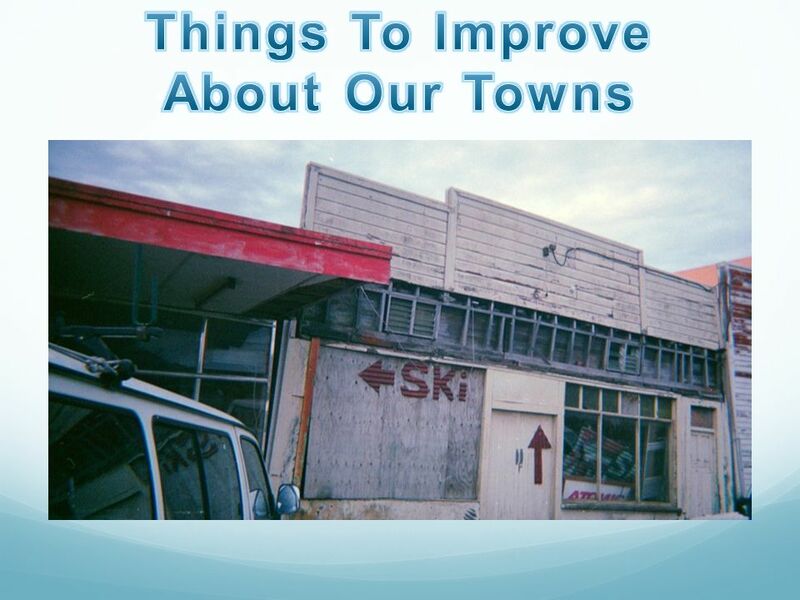 Other reasons given are it being too small here and there being more opportunities elsewhere; and the area being boring. Of those who plan to leave the area to study, most are unsure whether they will return to the district after their studies (58.9%). 5 Youth Voice “adults don’t really take kids my age seriously when we need to be heard” “every suggestion the students make gets shut down and looked down upon. In the community we don’t have the opportunity to be heard and if we do we don’t hear about it” “they don’t listen to what we say. It’s like it goes through one ear and out the other. That needs to change”. Only 11% of respondents thought that local young people get heard and have a say in how things work, while 55% thought they didn’t get heard or have a say and 34% said they didn’t know. 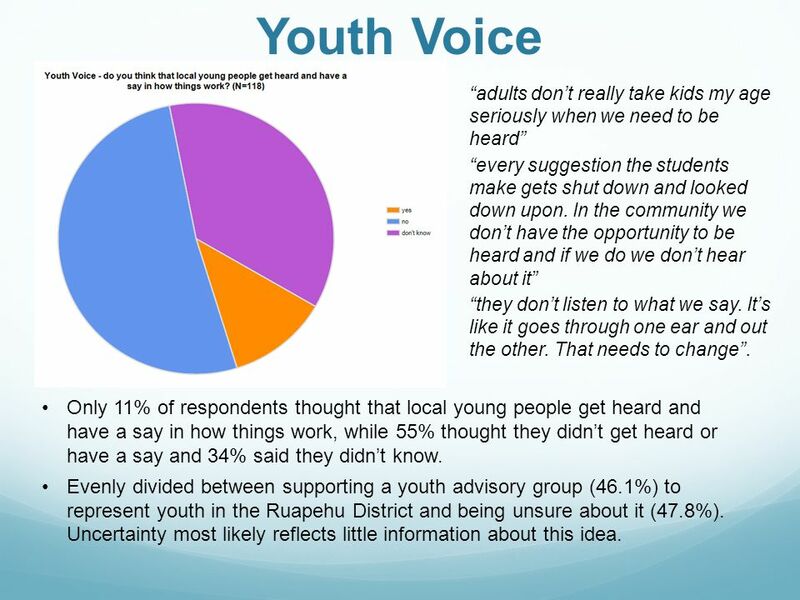 Evenly divided between supporting a youth advisory group (46.1%) to represent youth in the Ruapehu District and being unsure about it (47.8%). Uncertainty most likely reflects little information about this idea. 6 The Photo Voice Project How did we do this? Took photos of the things we like in the community, and the things we would like to see improved. Why? The survey we did last year at Ruapehu College found that the majority of students plan to leave the area after finishing college. We wanted to understand more about the reasons why. More resources are being put toward tourism, rather than youth development. We don’t feel youth have a voice on community initiatives. 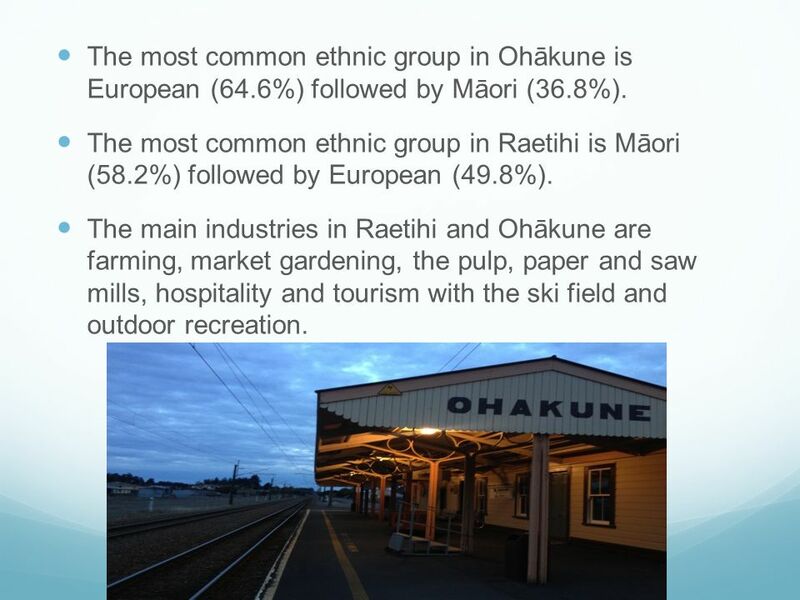 8 The most common ethnic group in Ohākune is European (64.6%) followed by Māori (36.8%). The most common ethnic group in Raetihi is Māori (58.2%) followed by European (49.8%). The main industries in Raetihi and Ohākune are farming, market gardening, the pulp, paper and saw mills, hospitality and tourism with the ski field and outdoor recreation. 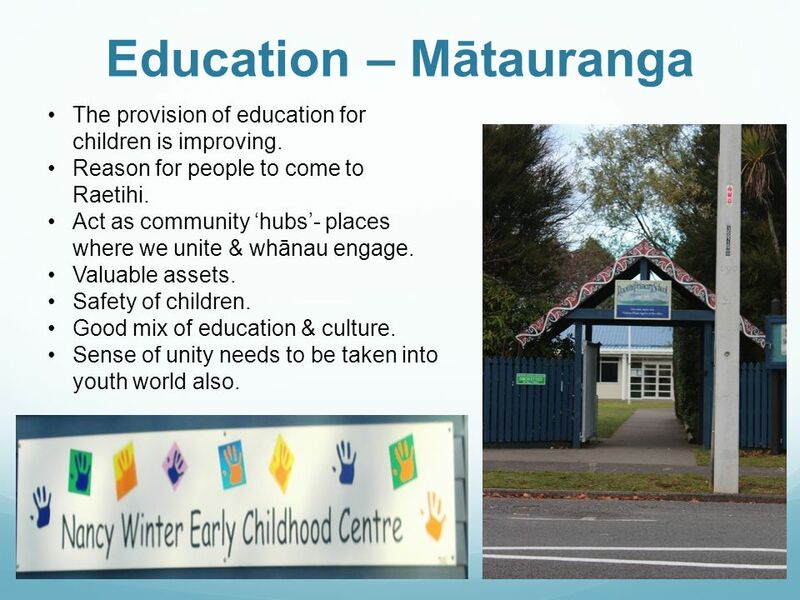 10 Education – Mātauranga The provision of education for children is improving. 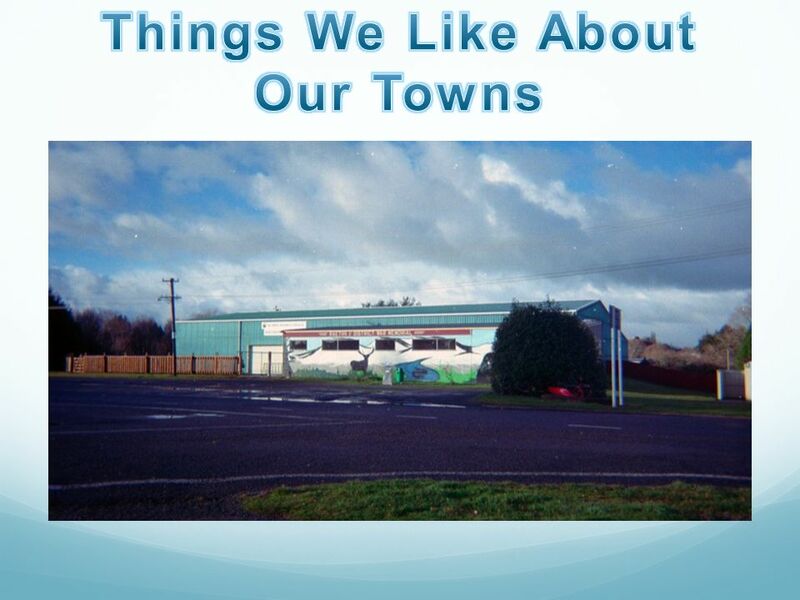 Reason for people to come to Raetihi. Act as community ‘hubs’- places where we unite & whānau engage. Valuable assets. Safety of children. Good mix of education & culture. Sense of unity needs to be taken into youth world also. 11 Culture Cultural festival and activities are provided at most schools in the area. 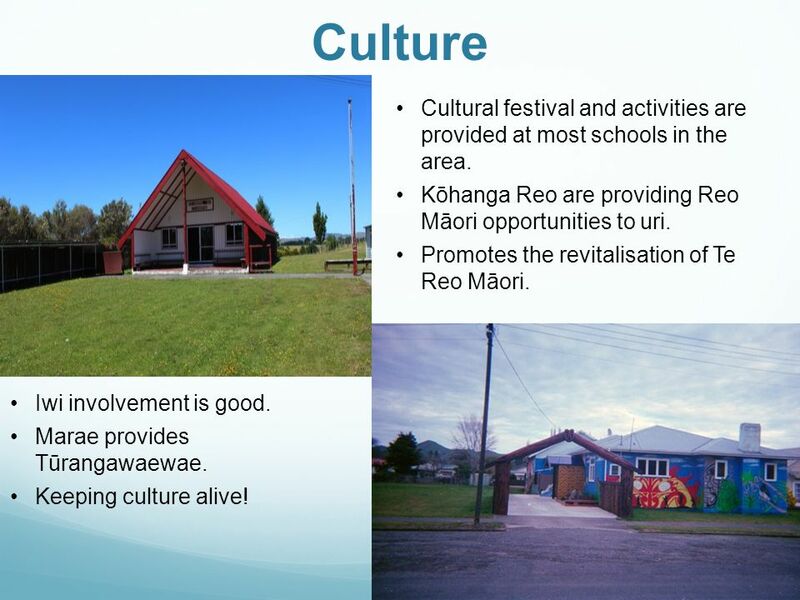 Kōhanga Reo are providing Reo Māori opportunities to uri. Promotes the revitalisation of Te Reo Māori. Iwi involvement is good. Marae provides Tūrangawaewae. Keeping culture alive! 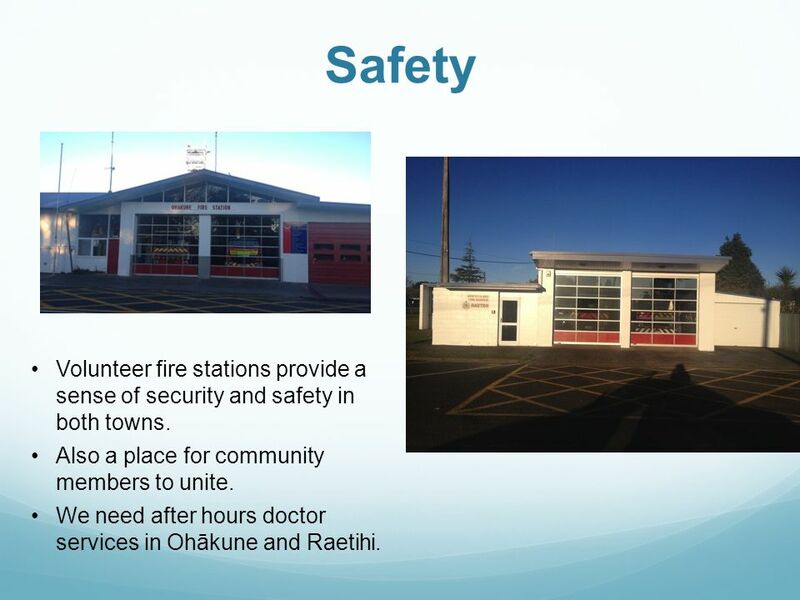 12 Safety Volunteer fire stations provide a sense of security and safety in both towns. Also a place for community members to unite. We need after hours doctor services in Ohākune and Raetihi. 13 Employment Hospitality industry predominant in the area for employment. Places like Angel Louise and Mountain Rocks cafes provide this for youth particularly. 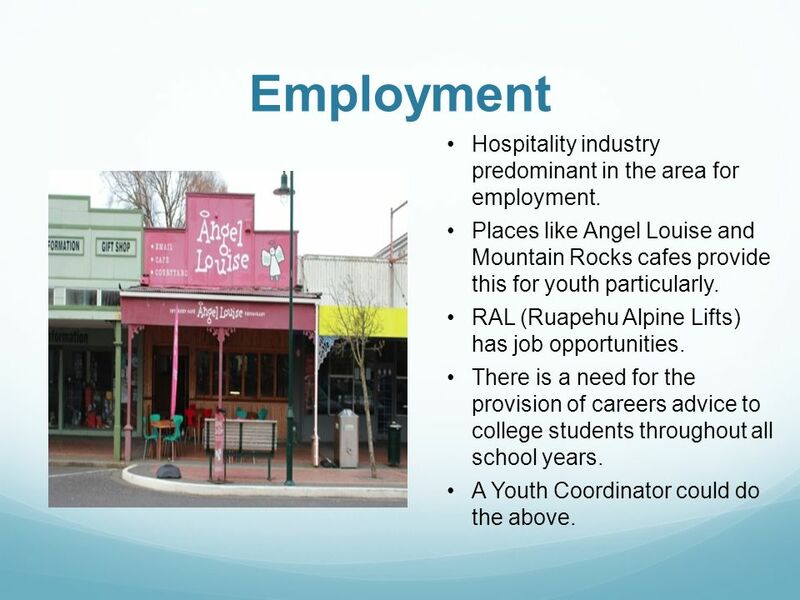 RAL (Ruapehu Alpine Lifts) has job opportunities. There is a need for the provision of careers advice to college students throughout all school years. A Youth Coordinator could do the above. 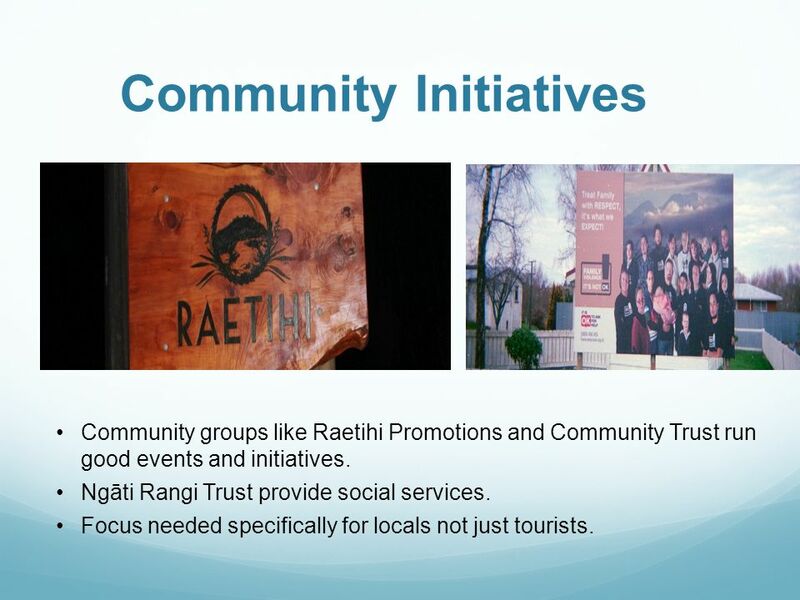 14 Community Initiatives Community groups like Raetihi Promotions and Community Trust run good events and initiatives. Ngāti Rangi Trust provide social services. Focus needed specifically for locals not just tourists. 16 Recreational Opportunities Recreational facilities- swimming pools, the Royal Theatre, music equipment – all provide for ‘something to do’. Provide possible career opportunities i.e drama at the theatre. 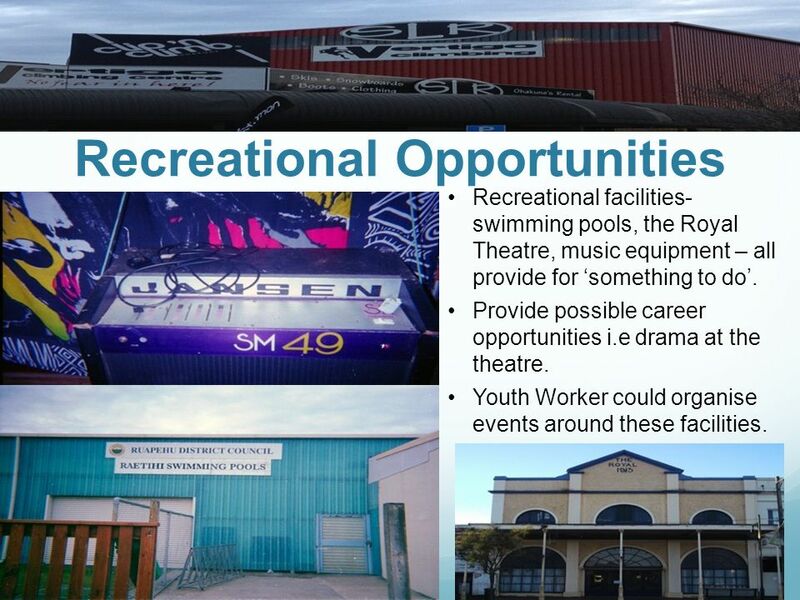 Youth Worker could organise events around these facilities. 18 Shops Lack of occupied shops. Affects morale of community. Need more businesses. Untidy. No competition = high prices. 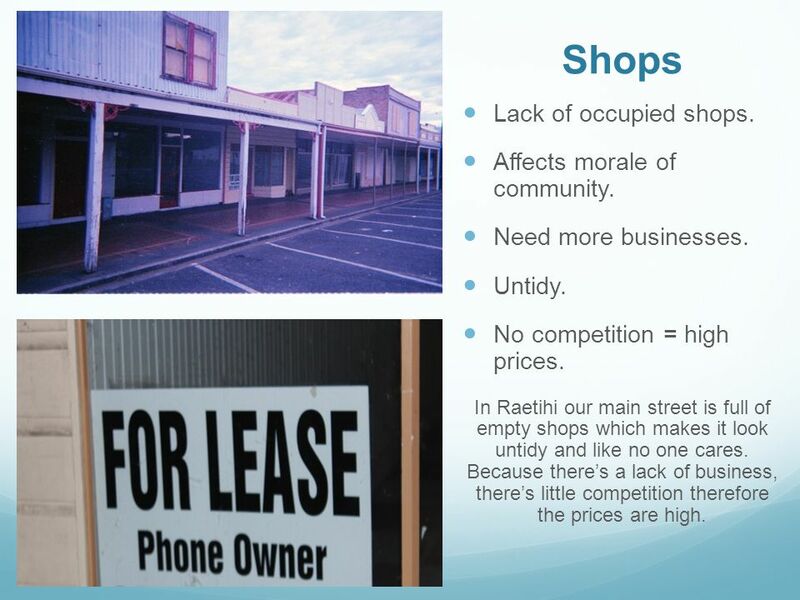 In Raetihi our main street is full of empty shops which makes it look untidy and like no one cares. Because there’s a lack of business, there’s little competition therefore the prices are high. 19 Our recommendations? 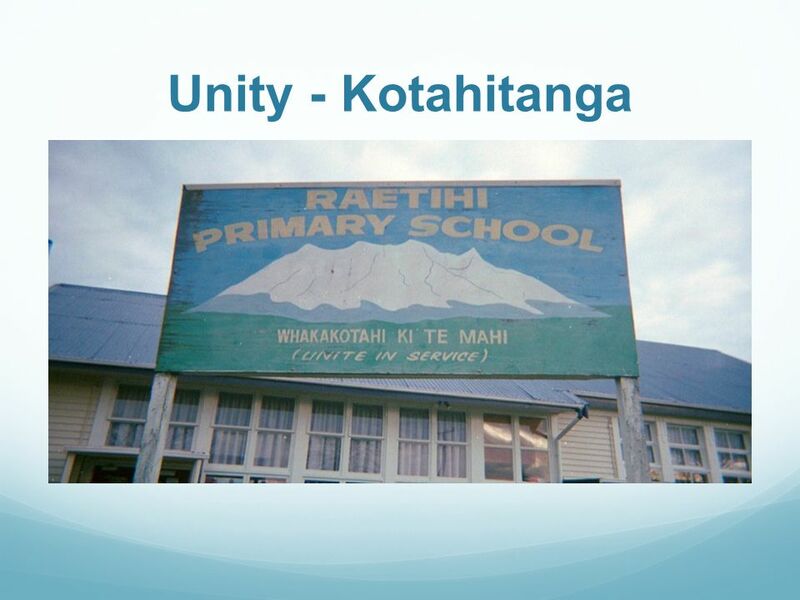 Tidy up Raetihi. More business opportunities and choices. Local ‘loyalty card’. 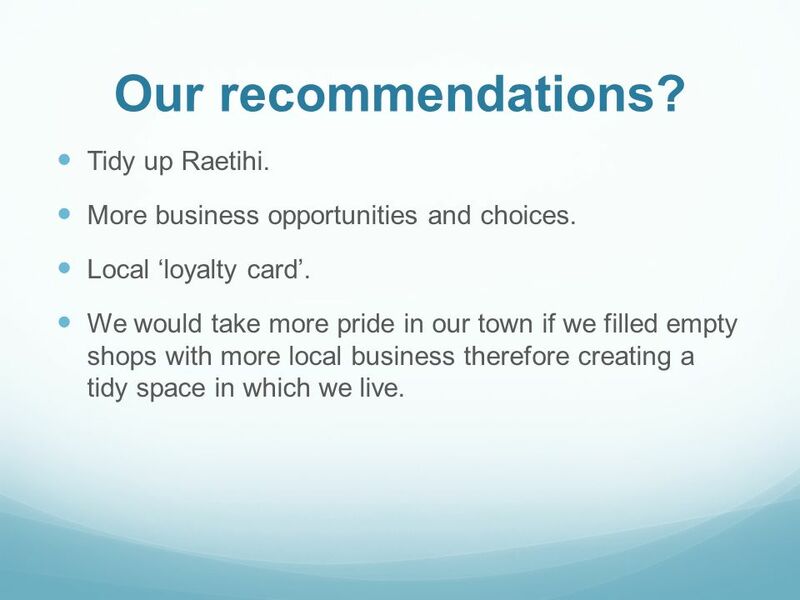 We would take more pride in our town if we filled empty shops with more local business therefore creating a tidy space in which we live. 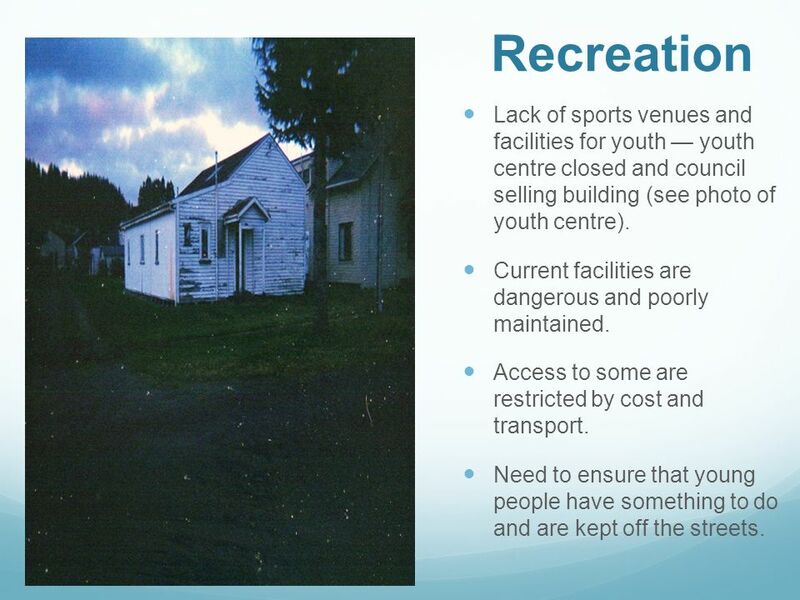 20 Recreation Lack of sports venues and facilities for youth — youth centre closed and council selling building (see photo of youth centre). Current facilities are dangerous and poorly maintained. Access to some are restricted by cost and transport. Need to ensure that young people have something to do and are kept off the streets. 21 Recreation Expand and upgrade current facilities. Improved access in terms of transport – increasing participation. More affordable and inclusive options. More ‘age appropriate’ choices. 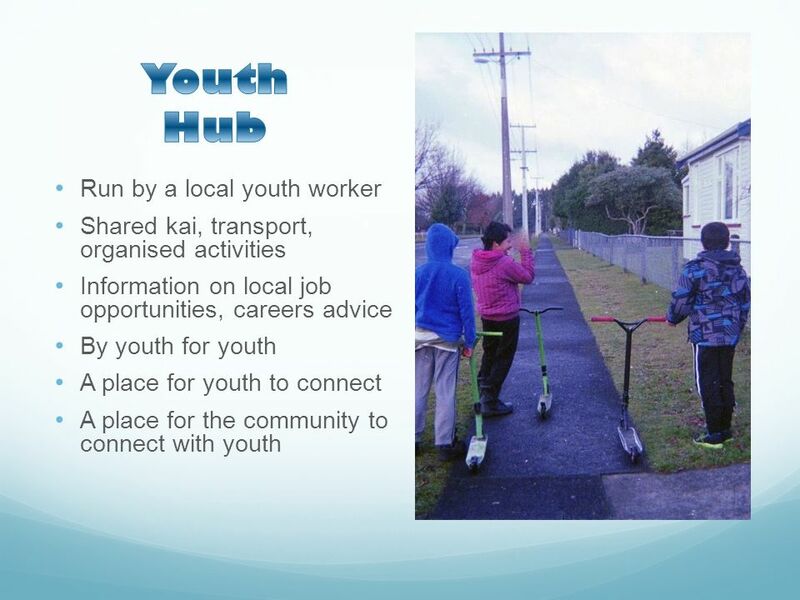 Establish a ‘Youth Hub’. 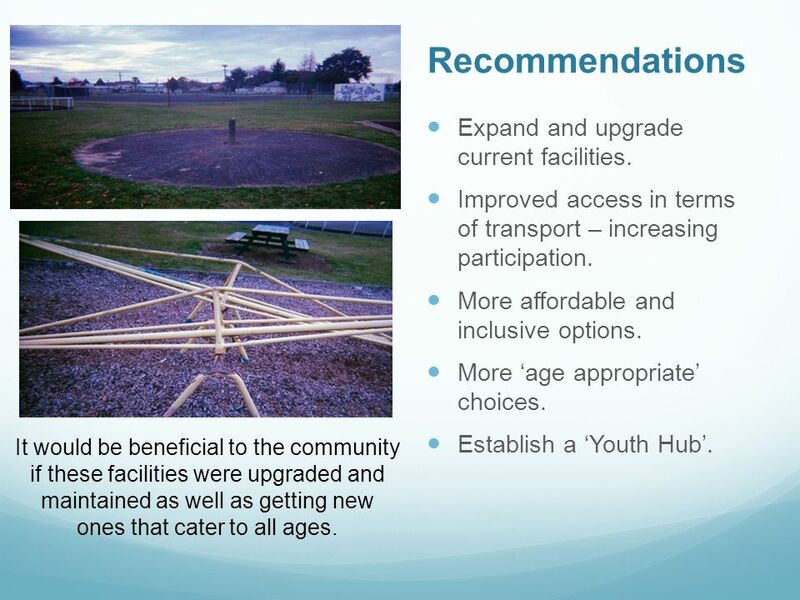 Recommendations It would be beneficial to the community if these facilities were upgraded and maintained as well as getting new ones that cater to all ages. 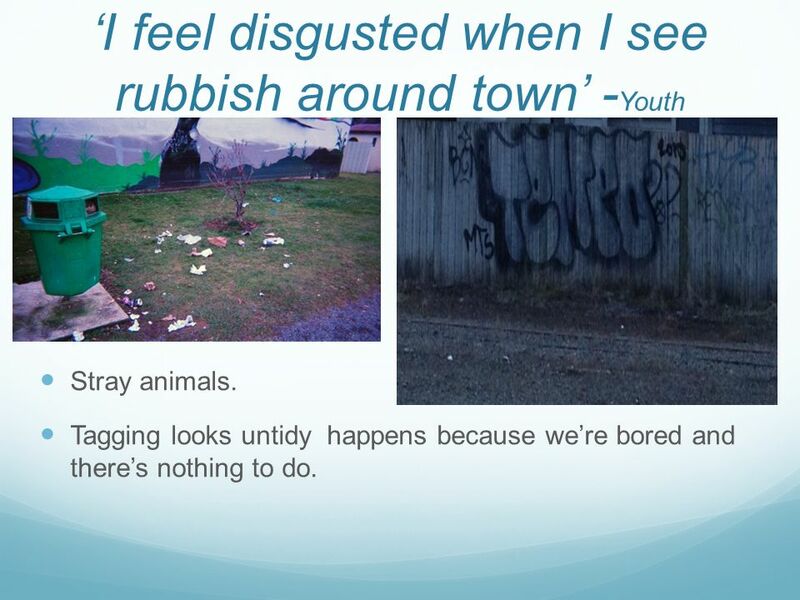 22 ‘I feel disgusted when I see rubbish around town’ - Youth Stray animals. Tagging looks untidy happens because we’re bored and there’s nothing to do. 23 What we recommend? More control of stray animals, especially dogs and cats. Promote Graffiti – ‘OK Graffiti’. 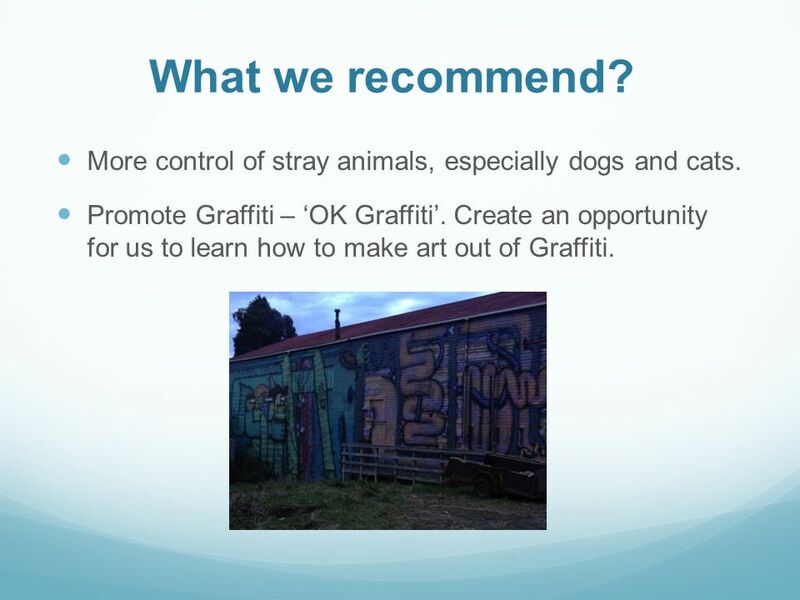 Create an opportunity for us to learn how to make art out of Graffiti. 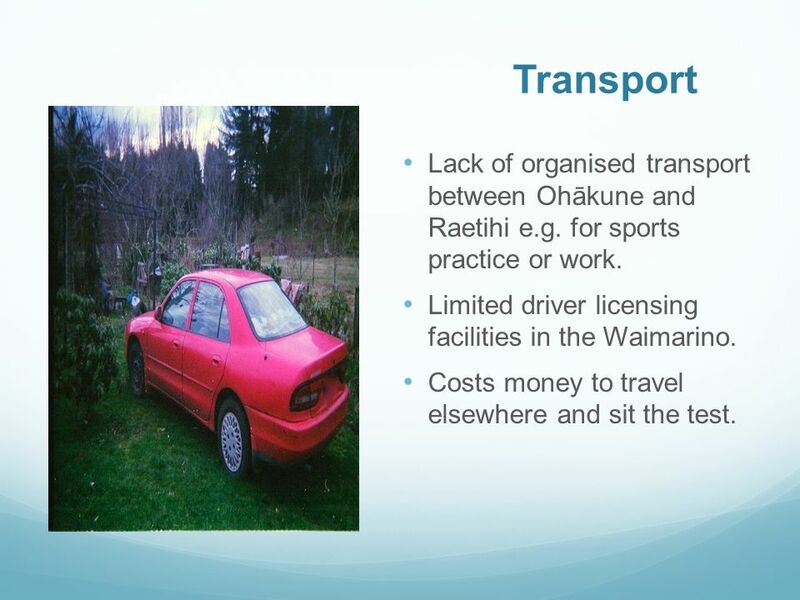 24 Transport Lack of organised transport between Ohākune and Raetihi e.g. for sports practice or work. Limited driver licensing facilities in the Waimarino. Costs money to travel elsewhere and sit the test. 25 What we recommend? More organisation around travel to recreational activities. 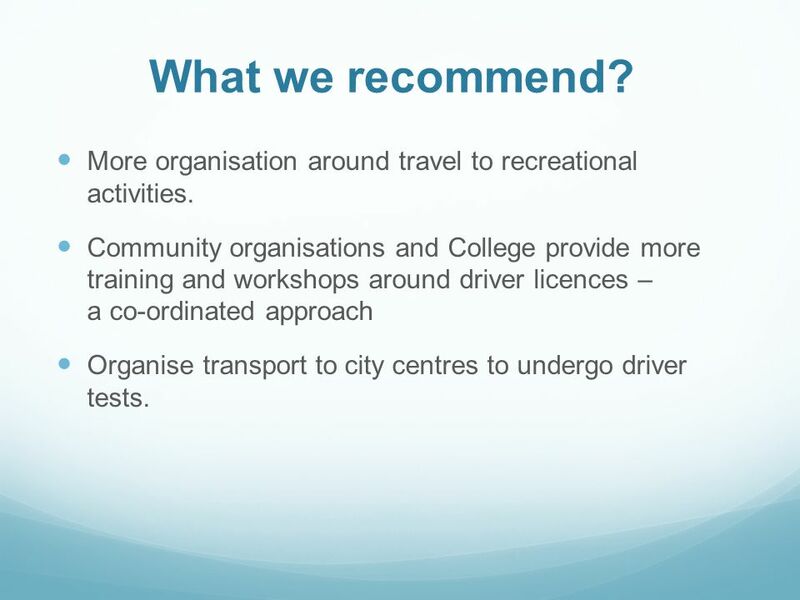 Community organisations and College provide more training and workshops around driver licences – a co-ordinated approach Organise transport to city centres to undergo driver tests. 26 Nothing to do ‘We are bored’! No facilities. Lack of organised community events. We are bored! Leads to vandalism, drug & alcohol use and contributes to high teenage pregnancies.  Busy day in Main Street Raetihi. 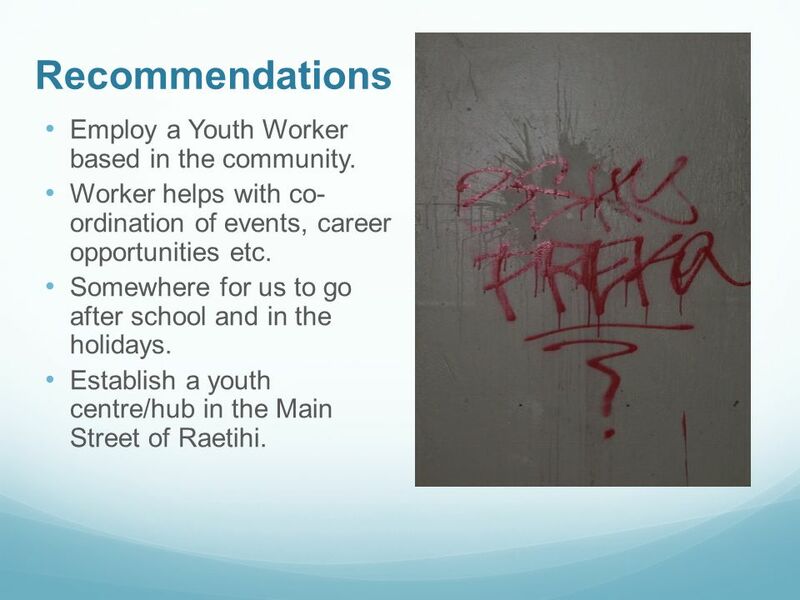 27 Recommendations Employ a Youth Worker based in the community. Worker helps with co- ordination of events, career opportunities etc. Somewhere for us to go after school and in the holidays. 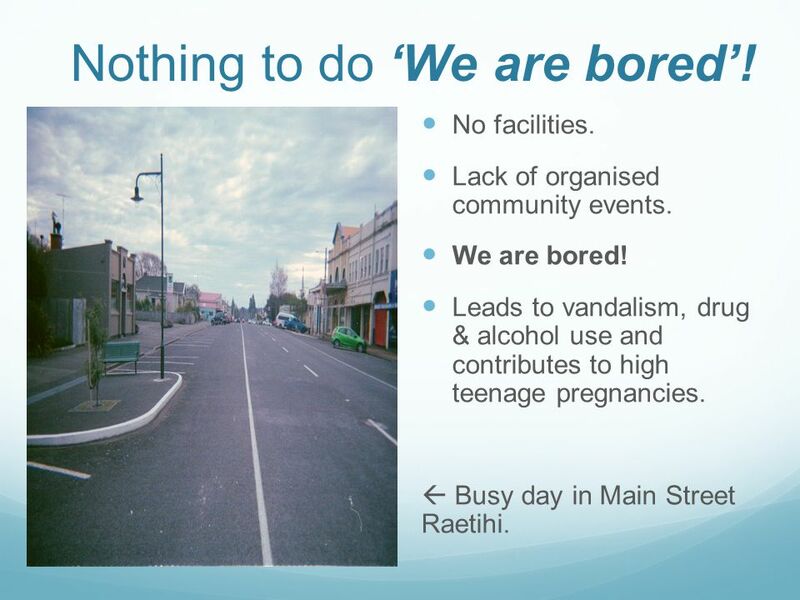 Establish a youth centre/hub in the Main Street of Raetihi. 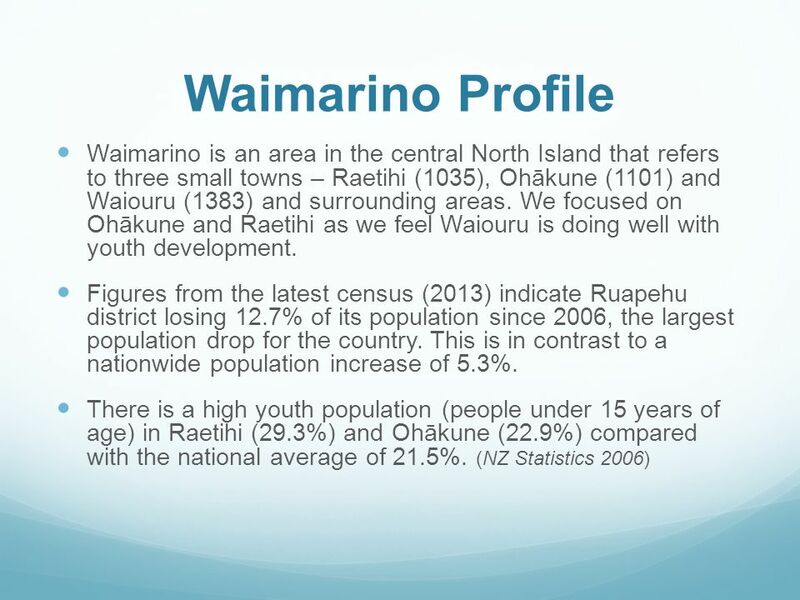 Download ppt "Waimarino For Youth. What Is Wai 4 Y and Who Are We? What? Wai 4 Y is a youth needs research project run by youth for youth. The Wai 4 Y project has three." The Commonwealth Fund 1999 International Health Policy Survey of the Elderly in Five Nations Accompanies May/June 2000 Health Affairs article Charts Originally. The Young People and Democracy Project Peter McLaverty. Harnessing and Enabling Community Enterprises Orla Flynn Head of CIT Crawford College of Art & Design November 2012. 1 Inside Youth Survey Hong Kong Youths Habits of Receiving Information about Mainland China and Taiwan 15 May 2012 Press Conference Co-organizers Research. Vocational Service Birmingham Early Intervention Service. Consultation Findings Moray Autism One Stop Shop Appendix 1. ATTITUDES & ACTIVITIES Cultured & responsible – This group has spent time in the last 12 months visiting Live theatre, the art gallery, museums and church. Working Groups launch. Today What a Working Group is How they will operate What work they need to do Finalise the Working Groups Get you to sign up and. Ministry of Education Perceptual Survey Overview. GO SOUTH GO CREATING A LEGACY FOR SOUTH LONDON. Action Plan Themes Overall coordination and information Business Tourism and leisure Culture, festivals. 27 th June 2006Irene Potter – Learning Partnership Conference. Local Government in your Community. Principal Member (Mayor or Chairperson) Councillors (from 6 – 21 depending on size/population of Council) Some Councils. Public Opinion : Health Care Coverage, Costs, and Financing. We care about Carers. Community Services Scrutiny Committee In depth Scrutiny Project Independence and well being of older people Southend Carers’ Forum.